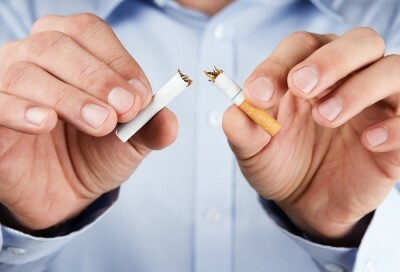 It can seem impossible sometimes to break a nasty habit, whether it be smoking, constantly checking your phone, chewing your nails, cracking your knuckles or even coughing and excessively clearing your throat. While no one wants to be stuck in an unhealthy habit, sometimes you’re not aware of these habits and others point them out to your embarrassment. While you may be in denial about biting your nails constantly or get defensive when someone notices a nervous tic or some other unwelcome habit, one of the first steps in breaking the habit is to acknowledge it. Then you can start to determine the triggers of the behavior and work towards ending it. Psych Central said that bad habits such as spending hours in front of a computer surfing the web could be a way to avoid interacting with your partner, and eating excessively could just be a way to comfort your foul mood. Dealing with the real problem causing the habits can be hard (especially with something like smoking, which is physically addictive), but it can correct bad behaviors that are driving you and others bonkers. Some habits have certain triggers. For example, you may only feel the need to smoke when you’re drinking socially, so try to address the drinking first, suggests a 2013 Huffington Post blog. Breaking the habit requires some planning and taking a practical approach, notes the blog. That means planning ahead to address bad behaviors or avoiding them altogether. Eating junk food could just come down to having junk food available, so remove them from your home or don’t go grocery shopping when you have a craving for them. You may subconsciously (or consciously) be perpetuating your own bad habits by creating an ideal environment for the habits to thrive. It can be very humbling to ask a partner or friend to help you stay on track with your habit breaking goals, but if you give one of two people permission to let you know when you’re taking part in a bad behavior, you can hit the reset button and carry on. Therapy can also help, or group support. Being with others that are also trying to break a similar habit, such as overeating when stressed, can help you reach goals and celebrate milestones together. Asking for help from people you trust will help you not to feel judged, and will also provide you relief (and perhaps also to those who put up with your habits). Easier said than done, right? Habits can become such a part of your psyche that breaking them may seem out of reach. However, habits are formed from repetition and the comfort you get from doing them, so it’s feasible to replace them with other behaviors. Habits can also be a sign of boredom, so getting stimulation in another way other than looking at endless web pages including getting exercise or taking up an artistic hobby could be a suitable replacement. The Huffington Post claims cutting out habits altogether without an alternative can make breaking a habit harder to deal with in the long-term, and leave needs that are addressed by the habit unmet. Reader’s Digest magazine says that you should pat yourself on the back when you’re making progress away from a bad habit (which probably also felt like a reward when you were taking part in it) such as eating junk food. Many unhealthy habits come from the weakness created by guilt or shame, which lead to the inability to avoid the bad behavior. Any success—whether it’s just catching yourself in the act once and managing to divert from it—is worth celebrating, noted Reader’s Digest. But that doesn’t mean eating ice cream as a reward for avoiding ice cream for a long period of time. Try an alternate reward such as buying yourself a new outfit, says the magazine. Have you ever suffered an ailment?
. . . He committed S-U-I-C-I-D-E??!!! NEW DISCOVERY ON HOW TO GET RID OF FIBROID NATURALLY WITHOUT SURGERY!